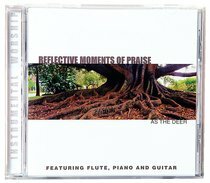 The REFLECTIVE MOMENTS OF PRAISE series offers instrumental versions of the top praise and worship choruses that dominate worship services in churches today. Featuring piano, flute, cello, oboe, harp, and guitar, the musical style on this CD creates a warm inviting ambience to any home. It is music that gently refocuses listeners back to their personal relationship with the Lord. KOORONG MUSIC MANAGER'S VIEW 2006: This DVD series has really set the benchmark for instrumental DVDs in the Christian market. Each one contains some of the top Praise & Worship choruses. Featuring piano, flute, guitar and a host of other instruments, they offer quality at a very affordable price. Perfect for personal devotions, they are relaxing and highly enjoyable. About "As the Deer (Reflective Moments Of Praise Series)"